If you are a fan of the Audi R8, then this video is for you. 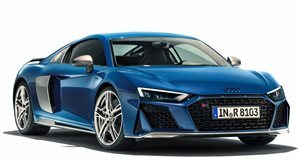 After five glorious years and six different models, Audi is celebrating their R8&apos;s half-decade milestone with a cool video showing off the supercar throughout the years. The Audi R8 packs a mid-mounted 4.2-liter engine and a soundtrack sure to get even the most blasé of automobile fans excited. Check out the clip above and let us know what you think about Audi&apos;s flagship supercar.